One of an occasional series offering a satirical look at VC propaganda. There’s something about this long-running campaign by Cycling Scotland that really irritates me. The original 2012 advert is a pathetic plea to drivers, imploring them to follow rule 163 of the Highway Code. Unless I’m sorely mistaken, it hasn’t improved cycling conditions in Scotland one bit. The biggest lie is how they pretend that children cycling to school is a normal thing nowadays, and that the cherry on the cake would be if they were given a vague amount of space on the very rare occasions that an automobile is encountered. Note the holes in the wool they’re trying to pull over your eyes though: The car-sick housing estate the children are on their bikes in at the end, including a car parked on the footway. I expect that normally this street is full of parked cars which would prevent such a textbook overtake, and that the producers of this advert had to ask people to move their cars for the filming. More propaganda. To the Dutch this advert probably looks like a normal everyday scene. But anybody in Britain knows that this isn’t based on reality. Perhaps there’s a couple of places that vaguely resemble this, but they’re few and far between. Though for me the oddest thing about this campaign is that it doesn’t even communicate its message clearly. The outstretched arms seems to suggest that drivers should make sure to give an arms’ length gap when overtaking, but we know that’s actually far too close. No actual passing distance in feet or metres is given, the message “give as least as much space as you would give a car” is open to interpretation. Some drivers would happily overtake another car – or a bin lorry – with only a few inches clearance. They might see this advert and assume their driving is just fine. So in short, it’s wasted time and wasted money. This sort of thing has been tried again and again for decades, with nothing to show for it as far as I can tell. But unfortunately there’s a whole industry that’s been built up around this kind of crap, whole armies of people whose jobs rely on the continuing failure of their dismal propaganda, so we can expect more of the same. There’s that saying, usually attributed to Einstein, about how repeating the same thing but expecting a different result is the definition of insanity – but when people’s wages depend on the repetition of failed ideas, perhaps that’s enough of an incentive to be cynically insane. In Chris Boardman’s otherwise excellent video about Utrecht, there was one dim patch – his claim that “the presumed liability law … ensures every road user is obliged to look after the more vulnerable”. I don’t know who is briefing Boardman, but it’s extremely naïve to think that anyone is worrying about the fine print in their insurance documents while driving – especially someone who drives badly anyway. If they’re not worried about dangerous driving laws, then they won’t care about a small aspect of their insurance policy. It’s a popular myth among cycling advocates that presumed liability (or strict liability) changes driver behaviour, even though the reality has been explained time and time again by people who live with it every day. The liability myth also ignores the fact that while almost every European country has such laws (the exceptions being the UK, Ireland, Romania, Cyprus and Malta), the cycling rates and safety statistics vary massively across Europe, with no clear correlation to liability laws. My introduction to the concept of presumed/strict liability laws – and the hyperbole surrounding it – was on one of the first cycling protests I ever went on. I didn’t even own a bike at the time, so took part on foot instead. Well, for well over a year now I’ve been living in a country which has presumed liability laws, and I can tell you that the human beings here aren’t fundamentally different from the human beings elsewhere. Here in Berlin, drivers don’t seem to possess that irrational hatred of people cycling as is common in the UK, but they can still be just as inattentive, aggressive or selfish when driving. Van drivers will still speed up to get through an amber traffic light. Young men still let their testosterone do the driving. People still use mobile phones and sat-navs while driving. Lorry drivers are still paid to deliver as quickly as possible. Taxi drivers still suddenly pull over into the bike lane for their passengers, or creep into the pedestrian crossing while the green man is lit. And arseholes will still pass dangerously close if they decide you’re not riding with due deference to motor vehicles (i.e. in the gutter). The only time I know I won’t experience bad driving is where there are no cars (due to filtering) or where there’s a cycleway. Those are the real changes that genuinely make cycling safe and attractive. After all that, yes to liability laws! Having said all that, I do believe that the UK should have presumed liability laws – it makes sense that a person who is injured by dangerous machinery shouldn’t have to worry about the financial effects of the incident while they’re recovering. Those expenses should be covered by the insurance of the person operating the dangerous machinery. But that’s all it is – it’s a piece of insurance law, a civil matter. It has no bearing on criminal liability. Such legislation is a good thing, but it won’t mean that dangerous drivers are automatically considered guilty after a crash. Liability laws aren’t a stick with which militant cyclists can beat drivers, no matter how much some may wish that was true. So by all means campaign for liability laws, but let’s stop pretending that they’ll create respect on the roads or cause bad drivers to reconsider their behaviour. Instead, campaign for the genuine benefits that they bring, which would be a positive change for all people injured by motor vehicles, way beyond these mythical claims. This article has also been published in German, here. Here is a guest post written by a Danish friend of ours who came to live in Berlin for five months this year. He’s now returned to Denmark, but before he left I asked his thoughts on cycling in Berlin, and transcribed his response. I’ve edited our chat into logical sections, and changed some words for clarity – ‘pavement’ into ‘footway’, for example. The photo captions are also mine. One of the first experiences I had with the cycling infrastructure in Berlin was when I found myself walking on a cycleway without realising. The difference between the footway and the cycleway is so subtle, they’re at the same level and almost the same colour. It’s only when someone passes you closely or rings their bell that you realise it’s a cycleway. When my parents visited I had to constantly watch out for them, tell them when they were walking on the cycleway. It’s so difficult to tell. You see tourists every day who are confused about it, they don’t see it. The widths of the cycleways in Berlin make absolutely no sense. Some are only wide enough for one person, and even the wider ones are still not wide enough to overtake another cyclist comfortably, so people end up using the footway to overtake. It impacts on people walking, of course, as people are cycling more on the footway. Cramped footway and level cycleway – yet space for five lanes for motor vehicles, plus a wide central reservation. So the width, they just get that wrong. You have to give 2 metres at least, like in Copenhagen, where some places you can cycle 4 abreast and there’s still room to overtake, although it varies throughout the city. When you can’t cycle beside one another you can’t be social, so cycling becomes a solo endeavour. Many times I’ve wanted to say something to the people I’m with, but have to shout it from behind. Imagine travelling in a car in which you can’t speak to any of the other occupants. Every time a cycleway or footway is too narrow, it kills the conversation that’s going on, as people have to go single file. Until I cycled in Berlin, I didn’t realise the importance of being able to ride socially in parallel, as opposed to serial mode. A cycleway in Copenhagen. Yes, it’s true: this entire smooth, wide surface is just for cycling (and related modes). I’ve come up with a theory that you can’t ride a bike for more than a few metres in Berlin without encountering a bump of some sort. Some cycleways are just constant bumps. My bike is now rattling due to parts coming loose on the uneven surfaces. I really don’t understand why tiles were chosen to surface the Berlin cycleways. They’re really annoyingly uneven. It all adds up, in terms of friction and resistance, compared to smooth asphalt they take much more energy to ride on. And I can’t imagine they’re much easier to maintain. You’re basically cycling on waves – waves made of hard tile edges. People in cars get smooth asphalt to ride on, while people on bikes get loose tiles amongst many other ever-changing surface types. In my time here, I’ve come to realise that I don’t enjoy cycling in Berlin, especially after my near-death experience with a bus, followed by being cut up by someone driving an SUV. It was a lucky thing that I was so awake and alert, and it was only because I’m so agile that I could jump off the road onto the footway when the bus almost hit me. And it was only because I was cycling slowly that there was no collision with the SUV – had I being going as fast as I often do, I’d have smashed into it. You can’t really count on the drivers to stop here when they should. A Danish friend of mine who also lives in Berlin says that there is this culture of drivers not being aware of bikes. I would certainly approach junctions more carefully here, and be ready to stop, because I’d be the one to lose out in a collision. The driver of the silver car has turned into, and is blocking, the cycle route. The junctions are designed in such a way that this frequently happens. I told that same Danish friend about Forester and Franklin and the idea of fighting for the right to the road, and he laughed out loud about it, just as I had when I first heard of it. It’s totally backwards. He’s probably the kind of guy who – if he’d grown up in Berlin – would be a radical cyclist, fighting for that right. But it’s only good for the fast ones who can keep up with traffic. Children and old people can’t ride like that. I guess it’s because of ignorance – you’d only fight for your right to the road when you’ve only known crap cycleways. I would probably be fighting for that right if I’d grown up here. And only if I was thinking about myself, of course. Thinking about my grandmother, it makes no sense. She’s 81, lives in Denmark, and she cycles pretty much every day. Where she lives there’s a segregated cycleway a couple of metres away from the road. I can only rarely remember having seen people in DK who have chosen the road over the cycleways. It could be that they were just tourists, or maybe I’m inventing that memory now I’m being asked about it. I don’t think I’m unique, every Danish person would realise how ridiculous VC is. It’s not a thing in Denmark. It just couldn’t be. Where I grew up in Odense I had my own wide cycleway, it wasn’t even beside a road. That’s how I got to school – on my own road, only for cycling. I grew up in an urban area, there’s a network of cycleways away from roads, all the way from home to school and everywhere else. We lived in two different parts of the city, and they both were connected to a safe cycling network. I would say that Odense feels safer than Copenhagen. It’s a lot less crowded, and you’re not even near the road for the most part. I don’t think I valued it, I never thought it was unusual. I could do things that I wouldn’t have been allowed to do otherwise, as my mum could trust me to cycle alone without worrying. As a child, while I was cycling home from school on these cycleways – cycle roads, really – I would play games in my head, it was so safe you didn’t have to concentrate hard and be hyper-alert. It was entirely stress-free. Actually, that’s an understatement. 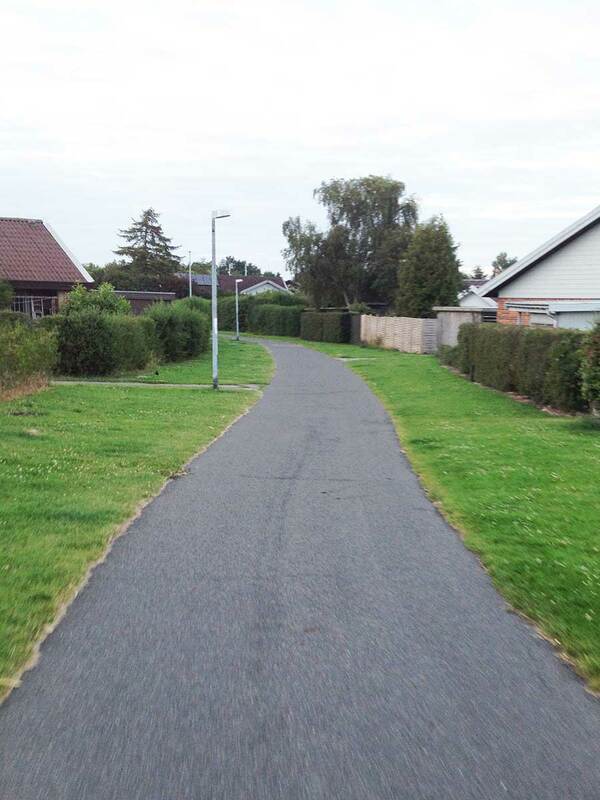 What stress-free cycling looks like in the suburbs of Odense, in Denmark. Unravelled cycleway through the very centre of a housing estate, with no cars anywhere nearby. Speaking of cyclists, I think it’s one of those self-reinforcing things. The number of cyclists relates to the quality of the infrastructure. Perhaps Berlin does better than the cycleways indicate, because so many people cycle on the wide footways, which is accepted here. You wouldn’t see kids cycling, for example, if they couldn’t ride on the footways. I had never thought much about cycling before moving to Berlin, it was just something I had always done and taken for granted. I’m not sure if I’d have thought about it so much if I hadn’t happened to moved in with the author of this blog. I’d have probably just not cycled much here and not really thought about the reasons why. I don’t cycle in Berlin anywhere near as much as I did in Denmark. It just feels unsafe here. There’s a big difference in the feeling of safety, you have to be very alert when you ride around here, compared to Copenhagen. The difference is the cycleways, which in Copenhagen are protected from cars, and clearly separate to the footway – so you don’t find cars on them or people walking on them. In Berlin, parking is prioritised over walking and cycling, it makes no sense. Just a few parking spaces are allowed to ruin the walking and cycling conditions for thousands of people. Even trees are prioritised over safe cycling! Notice how the carriageway remains unaffected by the line of trees. Cycling around Berlin resembles the pod-racing scene from Star Wars.